The reading of Catherine Mayeur-Jaouen’s new book on Coptic-Catholic priests in Upper Egypt (Paris 2019, in French) took up the bulk of my first days of February. At the same time moving, funny, sharp, critical, softened, compassionate, always specific, Catherine’s text describes people and situations that are largely ignored by foreign observers and Egyptians living in large cities. Upper Egypt, between Helwan and Luxor, is a totally underdeveloped land, abandoned since 1980s. 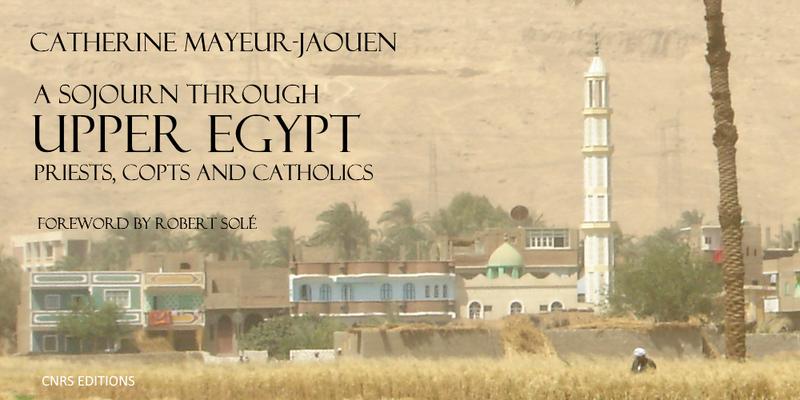 By adopting the perspective of Coptic-Catholics, an ultra-minority in Egypt, Catherine Mayeur-Jaouen takes us on a trip to the deep countryside, and gives us a new perspective on this country. From one village to another, relations with Muslim and Coptic-Orthodox authorities can change completely, from outright hostility to real friendship. And everywhere, you find the same great poverty. This is a must-read! The IFAO and the IDEO are pleased to announce their joint offer of a one-year post-PhD fellowship in Cairo (September 2019‒August 2020) in the following fields: falsafa, kalām and naḥw. Click here for more information… (application deadline: April 30th, 2019). On February 17th, the second session of the seminar organized for French-speaking PhD students at the University of al-Azhar, as part of the Adawāt project, was held. Mr. Frédéric Lagrange continued his presentation on translation studies, presenting the issues related to linguistic variations in French and the strategies for their translation into Arabic. On February 14th and 15th, Mr. Guillaume de Vaulx participated in the conference “Man, Environment, War” organized by the National Museum of Natural History in Paris, during which he gave a lecture entitled “The Role of Classical Heritage in the Anthropocene Age: The Status of Nature and Animals in Classical Arab Thought”. On February 27th and 28th, René-Vincent du Grandlaunay, OP participated in the conference “From Stone to Paper, from Paper to Digital” organized in Alexandria by Senghor University, during which he gave a lecture entitled “Libraries are preparing for the cataloguing of manuscripts according to the RDA rules”. On February 28th and March 1st, Alberto Ambrosio, OP participated in the international conference “From Islam in Luxembourg to a European Thinking Regarding Islam” organized by the Luxembourg School of Religion & Society, during which he gave a lecture entitled “From a Fashionable Islam: Mystical, Political, Aesthetic”. On February 7th, Mr. Dominique Avon gave two lectures at the Abdul-Aziz Al Saoud Foundation in Casablanca, the first with Mr. Abdelkrim Madoun entitled “Teaching the history of religious facts”, and the second, entitled “The challenges of diversity for religious leaders and their training in a modern context”. On February 14th, Emmanuel Pisani, OP gave a lecture on the topic of “Suicide in Islam”, as part of the DU in Suicidology at the University of Paris-Descartes. On February 19th, Emmanuel Pisani, OP gave a lecture entitled “Islamic Studies as a Resource in the face Islamic Fundamentalisms” as part of the training organized by the EPHE on religious mediation for sixty Muslim chaplains. On February 26th, Jean Jacques Pérennès, OP gave a lecture at the Tantur Ecumenical Institute in Jerusalem on the topic of “The contribution of the Church in Algeria to Islamic-Christian relations”. On February 8th and 9th, Emmanuel Pisani, OP gave a 9-hour session at the Pey-Berland Institute in Bordeaux on the topic of “Meeting the Other: Theology and History”. On February 19th, Jean Druel, OP led a workshop on transliteration from Arabic into the Latin alphabet for the students of the Department of Arab and Muslim Civilization at the American University in Cairo. Various tools are available on the “Toolbox” page of our website. From February 5 to 21st, René-Vincent du Grandlaunay, OP, Mr. Ahmad Chleilat and Mr. Mohamed Malchouch went to the Casablanca Book Fair to acquire books for the library. Books from the region (the Maghreb) are indeed very difficult to find in Egypt. On February 1st, we received a visit from a team from the La Pira Library in Palermo. The Fscire Foundation (Fondazione per le scienze religiose Giovanni XXIII), chaired by Alberto Melloni, will soon inaugurate a library dedicated to the intellectual history of Islam. Rosanna Budelli (librarian), Margherita Picchi and Francesco Cargnelutti (researchers), came to study the possibility of collaboration with the IDEO. On February 5th, we welcomed for lunch Mr. Ahmad Khan, Professor of Islamic Studies in the Department of Arab and Muslim Civilization at the American University in Cairo. On February 5th, we received for lunch Mrs. Myrhem Tolba, a Master’s student in geopolitics at the French Institute of Geopolitics (Paris). On February 8th, we welcomed a group of teachers from the French High School of Maadi for the day. On February 9th, we welcomed Bishop Robert Le Gall of Toulouse and a group of pilgrims from his diocese on a visit to the Coptic Catholic and Orthodox Bishops of Upper Egypt. On February 21st, we welcomed for lunch Mrs. Safiyah Muyeen, Political Counsellor of the Australian Embassy in Cairo. In February, we had the pleasure of receiving at the Scholars’ House Mr. Ilyass Amharar, PhD student in Muslim theology at INALCO (Paris) and Iremam (Aix-en-Provence), Ms. Veronika Jankovics, PhD student at the Avicenna Institute in Piliscsaba, Hungary, Mrs. Mary Elston, PhD student at Harvard University, Mrs. Dorothea Reule and Mr. Denis Nosnitsin, researchers at the Hiob Ludolf Centre for Ethiopian Studies at the University of Hamburg, and Mr. Walid Saleh, Professor at the University of Toronto.